I've just realised that I am madly knitting away on socks and not telling you about them. I've mentioned them on the podcast but not on the blog. I think it's partly because it is so hard to take good photos of socks. They look weird laid flat and my socks are too baggy on the sock blockers and it's very difficult to take photos of your own feet. I therefore have a few poor photos of my socks. Still, I thought I'd share them anyway as the yarns are great and you need to know about them! I have completed 7 pairs of socks this year. I think it's because I have been so excited to finally have a pattern that works for my feet, so I am churning them out as fast as I can. The other thing driving this vanilla sock splurge, is the lovely self striping yarn I have become addicted to. The first sock to catch up on is from February. It was a yarn that I hadn't used before but I'm really pleased with it. The yarn is from Nicole C. Méndez, who is based in Germany. It was good to find another dyer in Europe who does self striping sock yarn. There aren't many out there. The yarn is called Ringel Sockenwolle and is 75% wool and 25% nylon, with a length of 395m. I loved these colours together and I adore my socks. 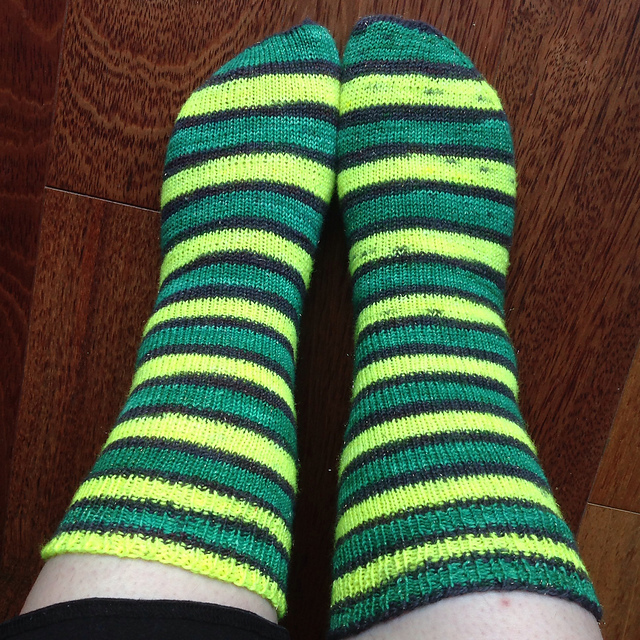 The only issue I have with them is that the stripes got out of sequence when I did the heel. Other than that, the socks are great. The yarn is really sturdy and there has been no bleed of the colours at all. I really enjoy the semi-solid nature of the stripes. I liked the yarn so much, I bought another skein. Once again I was drawn to this bright yellow that Nicole does. I think it is because I can't really wear yellow next to my face because of my colouring, but it is ok on my feet. 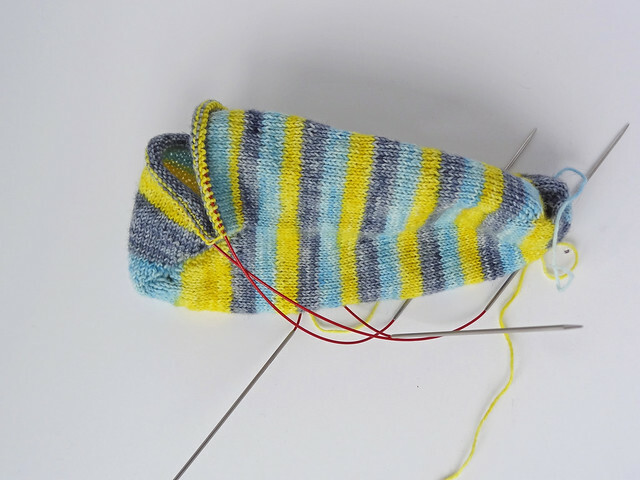 This time I didn't let my stripes get out of sequence by using the opposite end of the skein to knit the heels and then returning to the end used previously for the rest of the socks. 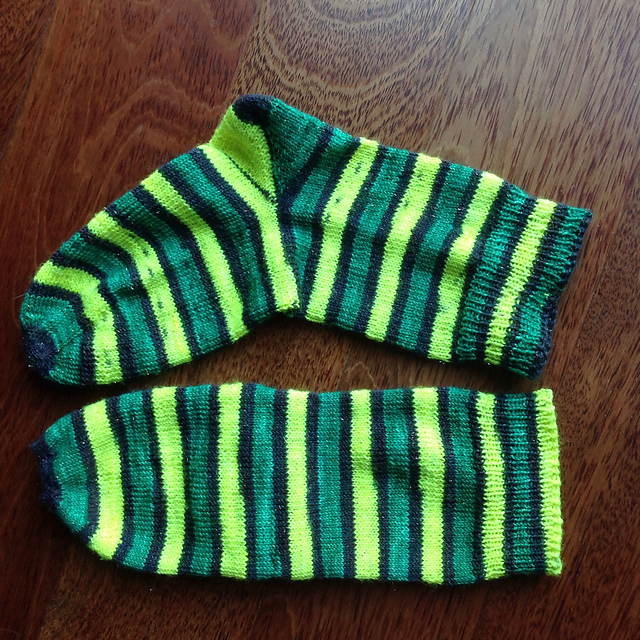 It makes all the stripes line up on the main body of the sock. This yarn feels quite robust when you are knitting it, but after a few times of being worn and washed, it softens up beautifully, but still retains it's strength. 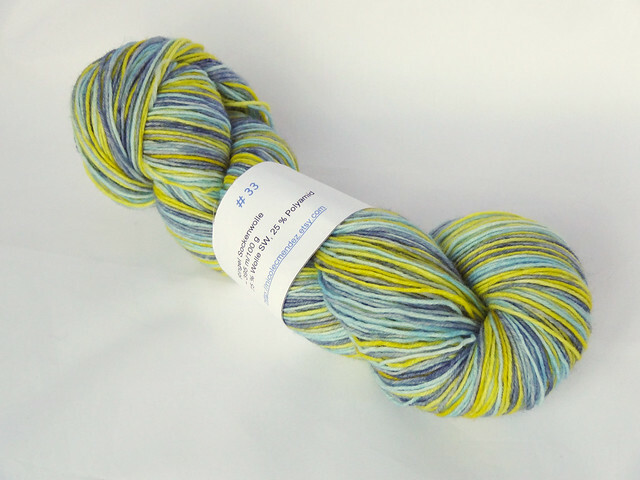 One of my other favourite striped sock yarns is from Twisted Limone. This one is called Find the River. These socks were knit in between the last two pairs. That is why the stripe sequence is out of whack! I don't really mind the stripes being wonky, but it does look pretty when they line up. 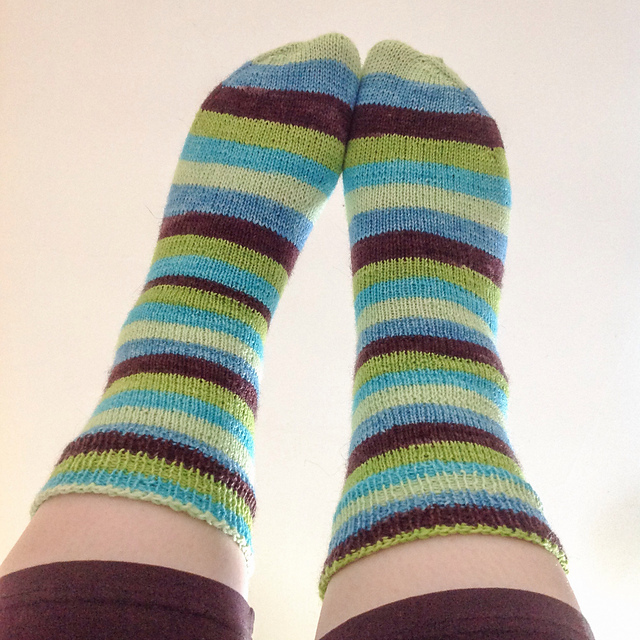 The final pair of completed socks uses yarn from Penguin Soup, Tuxedo Glitz. I love this base of yarn and it feels amazing on my feet. 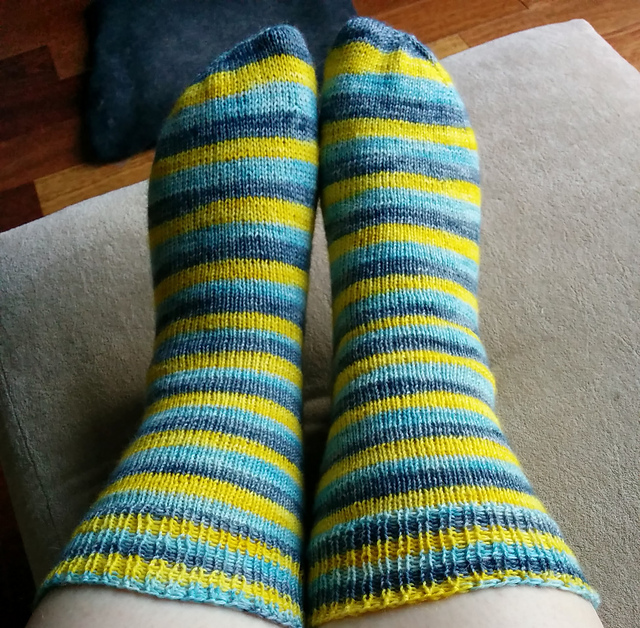 I'm pretty sure that this yarn is not as robust as the other socks in this post but it so soft, I don't care! 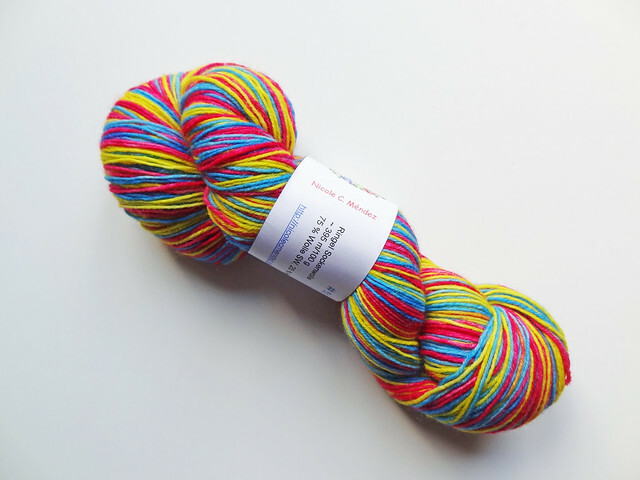 When I saw there was an "oops" skein that I could afford to get, because it came under the customs charge limit, I scooped it up. These socks came out perfectly. I think I like using the opposite yarn end for the heels. The heels look weird but the front doesn't, and you don't usually see the heels. See what I mean about socks looking strange without feet in them? Look at the difference. I call these my "witches socks". They are so fabulously garish and when I look at them they cheer me up! The stripes only match up on the feet because the right foot is longer than the left, so the stripes get out of sequence on the leg. I don't think you really notice it. I think I will try and keep you posted with each pair of socks in future. 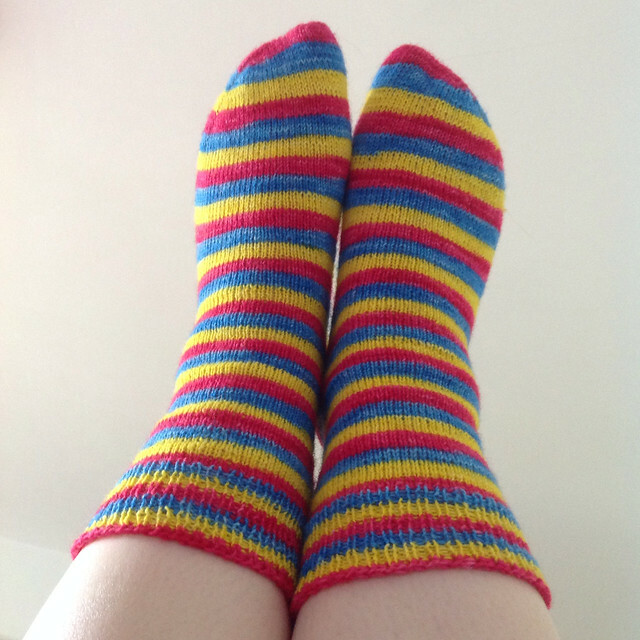 I can't keep doing these marathon sock posts, and I shall try and knit socks with a pattern on sometimes too!